Knowing how to say hello in Japanese is easy to learn and essential before visiting Japan, and could come in handy in other settings closer to home as well. Not only will knowing a little of the Japanese language bring a few smiles, it demonstrates respect and an interest in the local culture. Learning a few words of the local language is always a great way to better connect with a place. Japanese is actually easier to learn than other tonal Asian languages such as Mandarin, Vietnamese, and Thai. Plus, knowing how to bow the right way to a Japanese person rather than awkwardly trying to return an unexpected bow adds a lot of confidence. Even if you aren't completely sure how to do this, not returning someone's bow is very disrespectful. Just as you probably wouldn't offer a casual “hey man, what's up?” to your boss or an elderly person, Japanese greetings come in varying levels of formality depending on the amount of respect you wish to demonstrate. Japanese culture is steeped in honorific traditions and hierarchies depending on age, social status, and relation. Even husbands and wives use honorifics when speaking to each other. 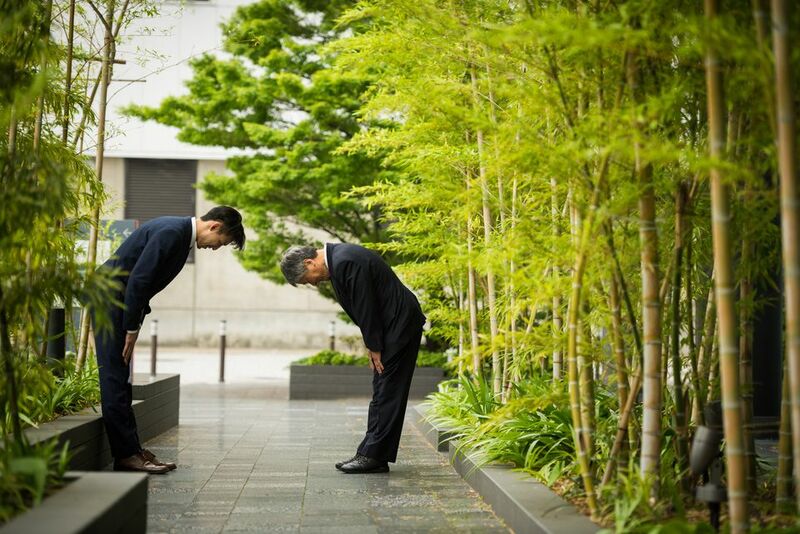 Greetings in Japanese and bowing etiquette are all a part of a complex system that applies the rules of saving face. You should always strive to avoid accidentally embarrassing or demoting someone in a way that causes them to "lose face." Although using the incorrect honorific can be a serious faux pas, fortunately, there is an easy default to use when not sure. Adding "-san" to the end of a name (first or last) is typically acceptable for any gender in both formal and informal situations, assuming someone is roughly your equal in age and status. The English equivalent could be "Mr." or "Mrs / Ms."
Konnichiwa (pronounced: “kon-nee-chee-wah”) is the basic way to say hello in Japanese, however, it is mostly heard in the afternoon. Konnichiwa is utilized as a respectful-yet-generic way to say hello to pretty much anyone, friend or otherwise. Konnichiwa was once part of a greeting sentence (today is…), however, its use has transformed the expression in modern times as a shortened way to simply say hello. The English equivalent could perhaps be similar to saying "good day" no matter the actual time of day. Although you can get by with the basic greeting of konnichiwa, just as when saying hello in Malay, Japanese people are more likely to use different greetings based on the time of day. Holidays and special occasions such as birthdays have their own set of greetings. Good Morning: Ohayou gozaimasu (pronounced: "oh-hi-oh goh-zai-mas") The greeting can be shortened by just saying ohayou (sounds like the way to pronounce the U.S. state of Ohio), however, this is very informal, much as you would offer a simple “morning” to a friend. Note: Although not tonal, the Japanese language does utilize a pitch accent system. Words are spoken with different pitches depending upon the region. The Tokyo accent is considered Standard Japanese and is the one you should use for learning pronunciations. But don't expect words you've learned to sound the exact same in different parts of the country! The formal and polite way to ask “how are you doing?” in Japanese is with o-genki desu ka? (pronounced: "oh-gain-kee des-kah"). The "u" at the end of desu is silent. To reply politely that you are doing fine, use watashi wa genki desu (pronounced: wah-tah-shee wah gain-kee des). Alternatively, you can just say genki desu (pronounced: gain-kee des). Follow both replies with arigato (pronounced: "ar-ee-gah-toh"), which means “thanks.” Say arigato! with enthusiasm and like you mean it. An informal, casual reply to a friend could be aikawarazu desu (pronounced: "eye-kah-wah-raz des") or “same as usual.” The cool kids love this one. Although knowing how to say hello in Japanese is mostly straightforward, the ins and outs of bowing can be bewildering at first to Westerners. Don't be surprised if your new Japanese friend offers a handshake to save you the potential embarrassment of not knowing how to bow. If you find yourself in a formal occasion where bows are exchanged — don't panic! First, remember that Japanese people don't really expect Westerners to have a detailed knowledge of their customs and etiquette. They will be pleasantly surprised if you demonstrate some cultural knowledge. In a pinch, a casual nod of the head will suffice in place of a bow if you're totally frozen! Regardless, to show respect, you must do something to acknowledge someone's bow. Give it a shot! Men bow with their arms straight, hands at their sides or along the legs, fingers straight. Women typically bow with their hands clasped in front of them. Keep your back straight, and bend at the waist with your eyes downward. The longer and deeper the bow, the more respect shown. Always bow deeper to elders and people in positions of authority. If unsure, simply maintain your bow slightly longer and deeper than the one you received. A casual bow consists of bending approximately 15 degrees at the waist. A bow to strangers or to thank someone would go to around 30 degrees. The most formal bow to show apology or extreme respect requires bending to around 45 degrees, where you are looking completely at your shoes. Tip: Unless you're a martial artist squaring up against an opponent, don't maintain eye contact as you bow! This can be viewed as an act of mistrust or even aggression. In a formal greeting, sometimes bows are exchanged over and over; you may wonder when it's safe to not return the last bow! Each consecutive bow should be quicker and less deep than the last until both parties come to the conclusion that enough respect has been shown. Sometimes a bow is coupled with a Western-style handshake — doing both at the same time can be awkward! If you're in a tight space or standing close after shaking hands, turn slightly to the left so that you don't bump heads. After all the bows and greetings have been exchanged, you may be given a business card. Receive the card with both hands, hold at the corners, read it carefully, and treat it with the utmost respect! Jamming someone's card into your back pocket is a serious no-no in Japanese business etiquette. The way to say cheers in Japanese is with an enthusiastic kanpai! (pronounced: "gahn-pie!"). The right way to pronounce sake (the drink) is "sah-keh," not "sak-key" as is often heard.